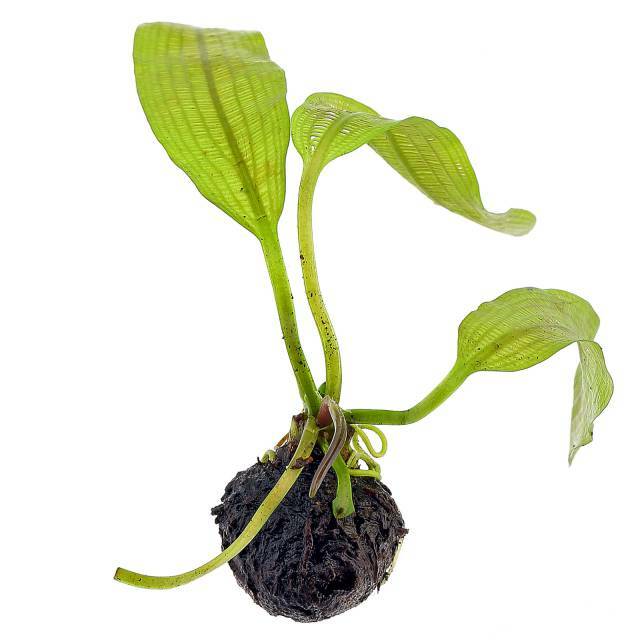 There are many different types of aquatic plants. 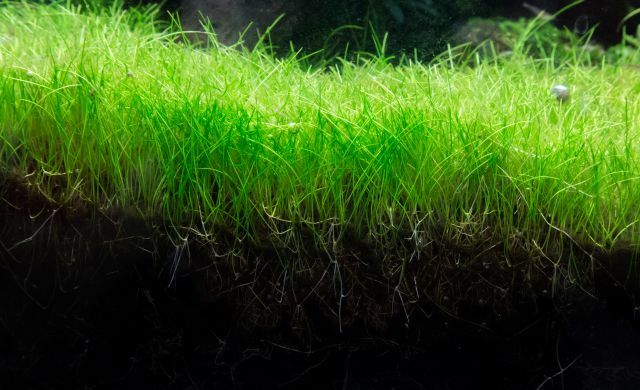 In addition to classic stem plants other greenery such as mosses, ground-covering plants und epiphytes are often used in an aquarium. 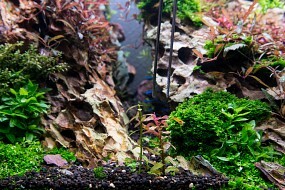 The latter ones mostly have a rhizome, including, for example, Anubias and most of the ferns. In the group of rosette plants we have plants such as Echinodorus and the Cryptocorynes. There are plants that propagate through runners, such as the well-known Vallisneria, and let's not forget tuberous plants such as the Tiger Lotus. All these plant types differ in structure and growth habits. Here we show you how to properly divide, trim and propagate these plants. . 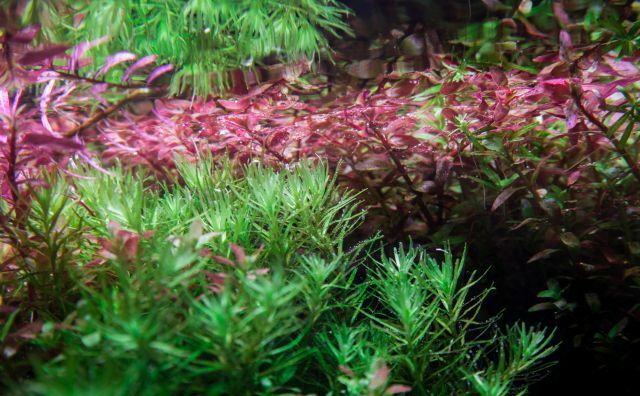 Stem plants such as those of the genera Rotala or Ludwigia are fast growers that quickly reach the surface. Once there, they’ll start growing along the water surface. Then (at the latest) the plants should be pruned, since the upper shoots shade off the lower parts of the plants. Lack of light makes them shed their leaves. Most stem plants can be trimmed at any given spot along the stem. The upper part of the pruned plant (the part you have just cut off) is called the head cutting. 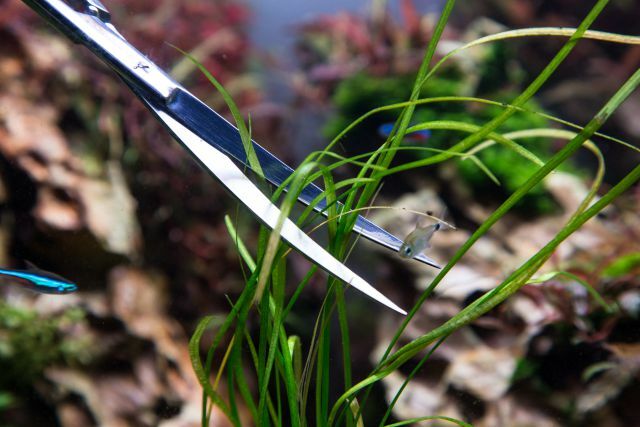 You can use this head cutting to propagate the plant, just stick it in the substrate with a pair of tweezers of a suitable length. Both the upper and the lower parts will continue to grow – the cut-off stem often produces multiple lateral shoots, the head cutting will take root and keep growing in length. This trimming technique will reward you with very nice, compact and bushy plant growth. 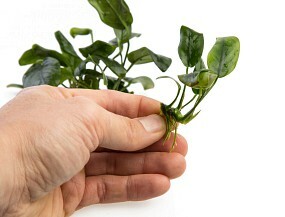 More tips on cutting stem plants can be found here. Most epiphytes such as ferns, Bucephalandra but also Anubias belong to the so-called rhizome plants (the genus Anubias has its own section below). These plants have a strongly pronounced rootstock, the so-called rhizome. You can see this quite nicely in this photo of a Java fern: the thick green shoots between the two red lines are the rhizome. The leaves, with stems and leaf blades, are above the rhizome, the brown holdfast roots are visible below. The rhizome is the most important part of this plant. It is comparable to a creeping stem. New leaves and roots both develop at the tip of the rhizome. Side shoots branch off of it. Always make sure that the rootstock remains undamaged, doesn’t rot or gets squeezed. At any time and without problems, holdfast roots and leaves can be trimmed or clipped with scissors in case the plant gets too thick or if dingy leaves spoil the look. The rhizome will sprout new shoots over time. Don't remove healthy leaves and roots from newly planted rhizome plants, give them some time to settle. If you cultivate Java fern (Microsorum pteropus) and variants of Bolbitis heteroclita, it might be worth keeping some of the old leaves, since they can be used for propagating the plant. Over time, so-called adventitious plants will develop - small young plants that grow from so-called bulbils on an older leaf. They develop on leaves that are still on the plant, and even more readily on severed ones. 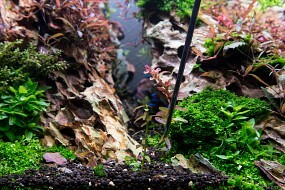 If the young plants have grown large enough, you can easily pluck them off and attach them elsewhere in your tank. 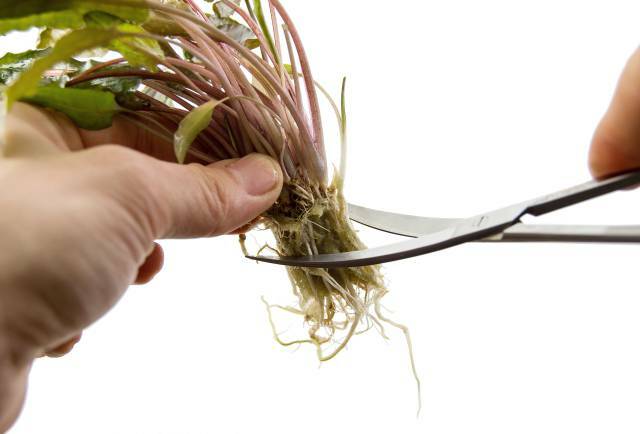 If you desire to divide a parent plant or a group that has grown too large in order to get new smaller plants, just cut the rhizome with scissors. 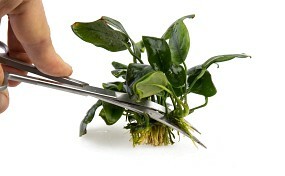 Use a very sharp pair of scissors to prevent the plant stem from bruising and to get a clean cut. Rhizome sections without shoot tips continue to grow by producing lateral shoots. The foliage with petioles and leaf blades is above the red line. The rhizome - the stem system - is visible between the red lines. 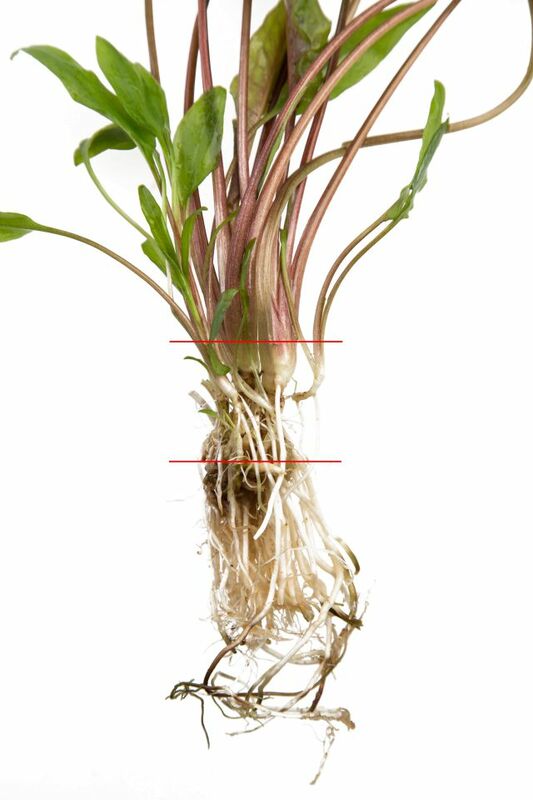 In this picture, the growing shoot tip is located at the right end of the rhizome. This is where new leaves and holdfast roots sprout. The rhizome may branch out through lateral shoots. You can clearly see the root system at the bottom. When Anubias grow under water, the roots are really more of a holdfast than a nutrient intake system, allowing the plant to attach itself to wooden or stony substrates. These roots can be clipped without a problem, which simplifies e.g. 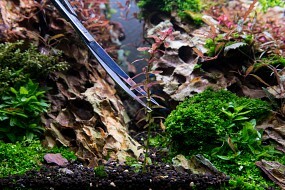 the introduction of plants into a new aquarium set-up. 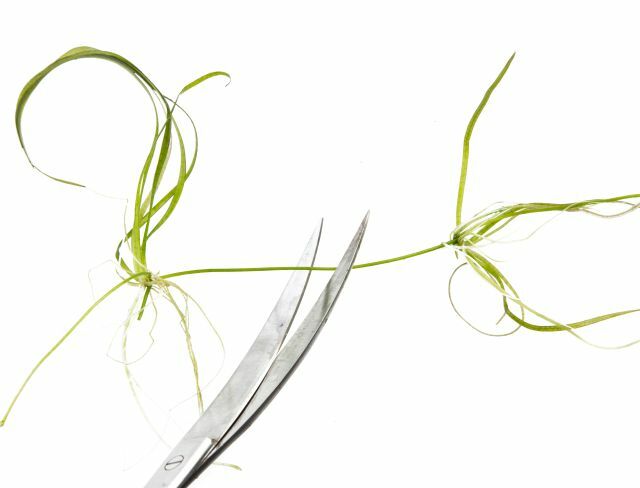 Leaves that have grown too big, are infested with algae or show signs of damage can be easily removed by cutting the petiole from the rhizome with a pair of plant scissors. No new leaf will grow from the petiole stump but rather from the rhizome’s shoot tip and side shoots. 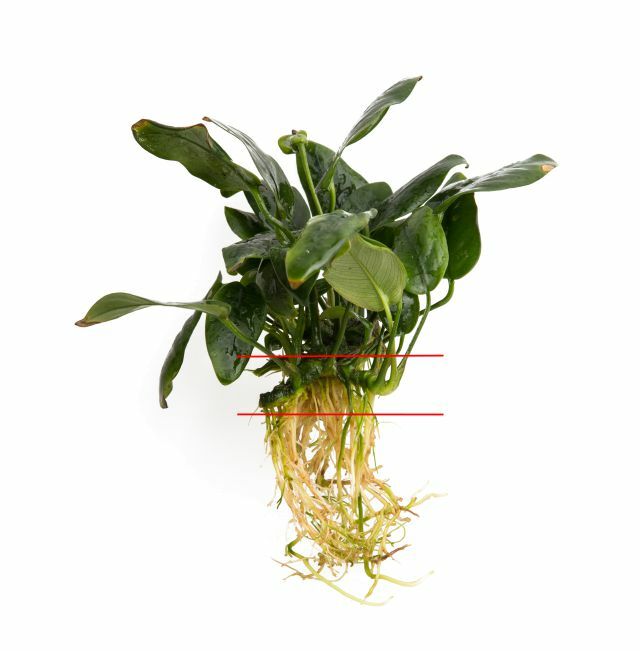 The rhizome is the most important part of an Anubias. 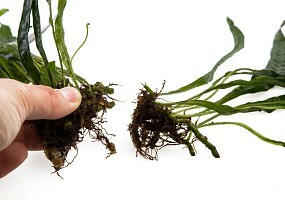 Even without leaves or roots, a rhizome can develop back into a complete plant. 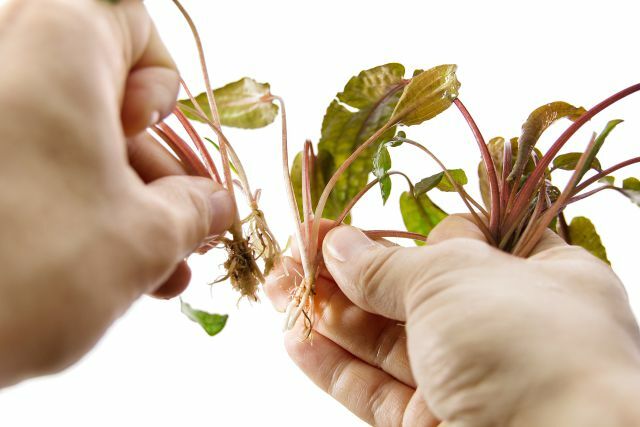 Therefore you should make sure that the rhizome stays intact and doesn’t get crushed or rots away. 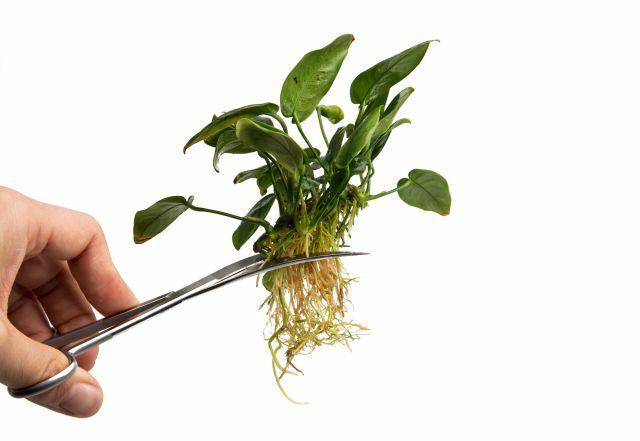 The latter may happen if the Anubias are planted too deeply into the soil instead of cultivating them as epiphytic plant above ground. 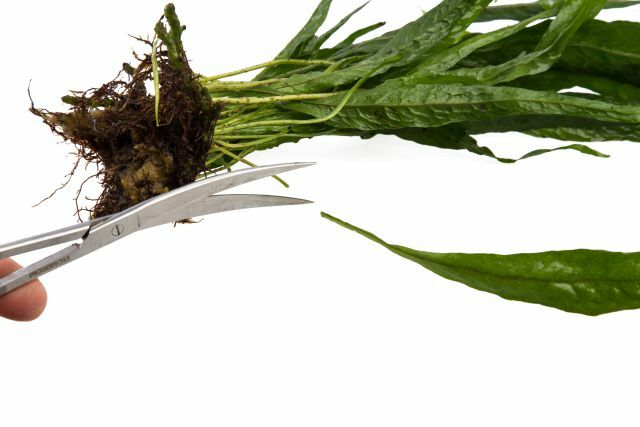 Nevertheless, the rhizome can be quite easily divided with a sharp pair of scissors in case you desire to create multiple singular plants from a big portion or a mother plant. 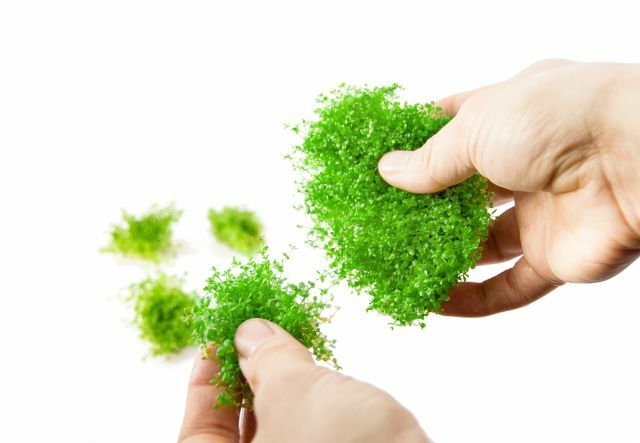 Almost any type of moss can be divided or trimmed super easily. Basically any tiny snippet of moss can grow back into a nice pillow. Keep this in mind when trimming moss under water. 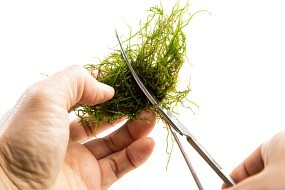 Trimming can be done with plant scissors or by plucking off small patches and fronds manually. . If smaller fragments get loose in the water, they will be carried through the aquarium by the current and start growing in another spot. It is highly recommendable to turn off the filter and siphon off any small remains directly with a hose. When setting up a new layout, it is best to cut trade-size portions of moss outside the water with scissors or to just pluck them apart gently. Larger portions should be divided into several smaller ones, which allows you to plant your tank more economically. 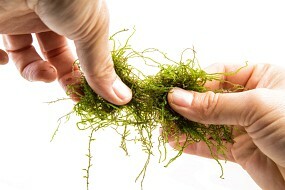 Tips for introducing mosses (for example, by tying or glueing) can be found in the article "Preparing aquatic plants" in the chapter on mosses. Ground cover plants are species with a flat growth habit that will grow to form dense plant carpets. In the aquarium, they are often used in the foreground. Popular plants for this area are for example Hemianthus callitrichoides “Cuba” or Glossostigma elatinoides. Find out more about this topic in our article "Ground cover plants". A typical ground cover plant portion usually consists of many individual plants grown into each other. It is more economical to divide a portion into several smaller ones before planting. The portion can be easily divided manually, just tear it apart carefully. 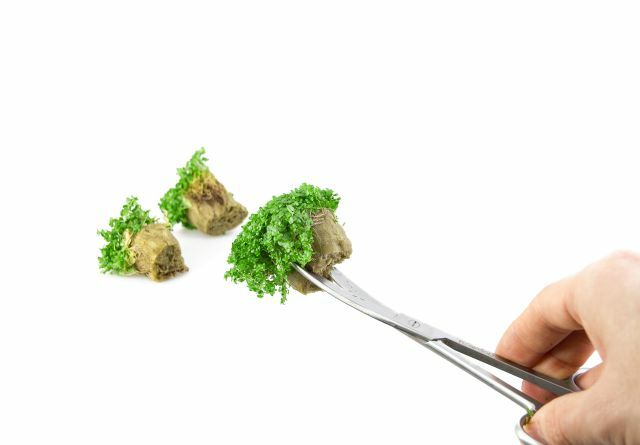 Alternatively, a portion can be cut apart into smaller pieces with scissors. 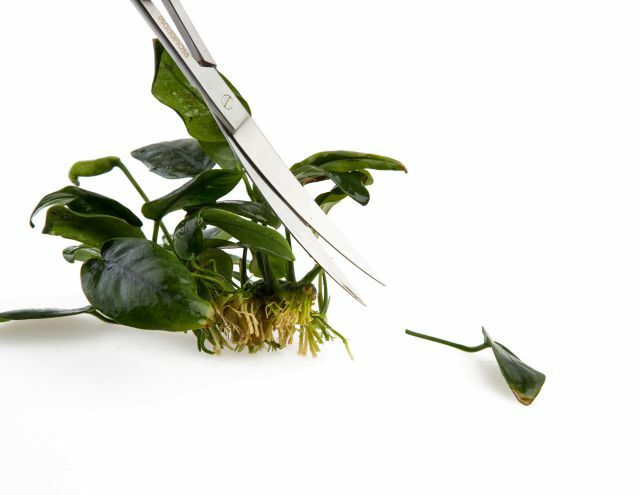 To prevent ground-covering plants from growing too wide or too high, you should trim them regularly with scissors. Cut all the upper shoots down to a few centimeters above the ground. 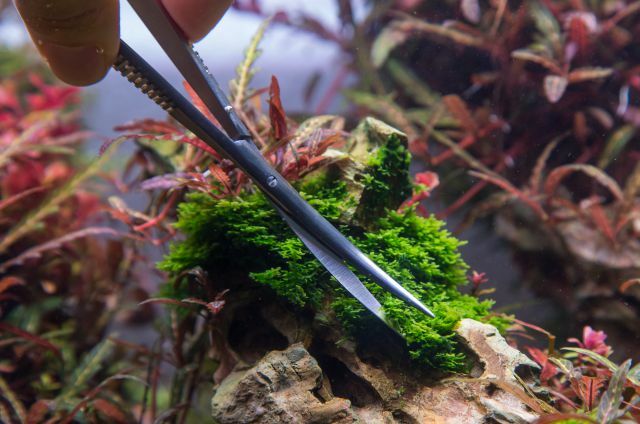 The best scissors for this task are special types like Wave Cutters or Spring Scissors, which are ideal for trimming foreground plants. The fine pieces you cut off when pruning ground covers should be siphoned out. We recommend the use of a skimmer (see also "Efficiently removing plant clippings"). It is important to thin cushion plants such as Hemianthus callitrichoides “Cuba” " regularly, so the lower plant parts get light again and don’t die. Otherwise, thicker plant pads will lose their hold over time and drift up. Crypts and Echinodorus are some of the most well-known rosette plants. Just like in the rhizome plants described above, the plant stem of rosette plants is in fact a strongly pronounced rootstock, aka a rhizome. In the rosette plants, however, the rhizome is much more compressed and grows below or just above the soil surface. Therefore, it is less visible than with rhizome plants. From the tip of the rhizome the leaves grow above and the roots below. The leaves sit densely at the tip of the stem, so they form a leaf rosette. New leaves appear in the middle of the rosette. The rhizome of a rosette plant may branch out, too, thus developing new leaf rosettes (adventitious plants). 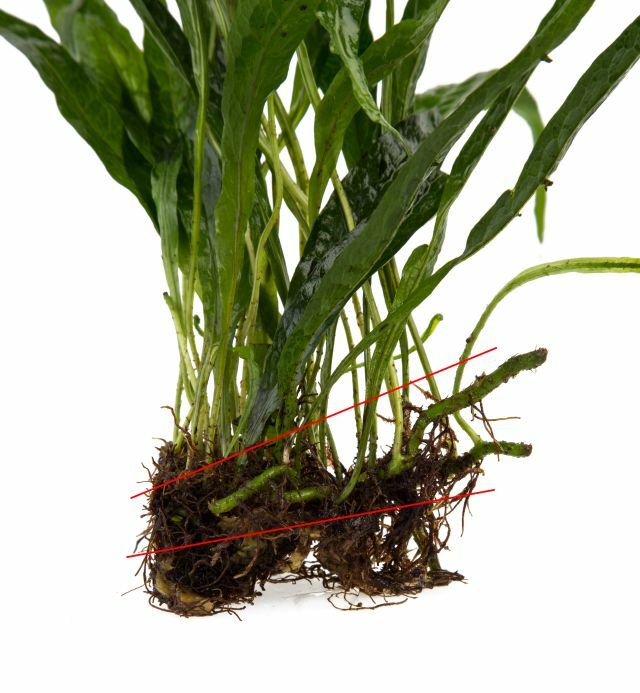 The photo above explains the structure of a Cryptocoryne. The roots grow below, above them there is a branched rhizome with multiple leaf rosettes. On top, there are the petioles and leaf blades. The rhizome is the most important part of the plant for its continued existence. If this area is still intact, even a bare rhizome without leaves and roots can develop into a whole plant under good conditions. You should be aware of the plant’s structure if you want to cut back a rosette plant or wish to prepare it for planting. It is easier to plant when you cut off longer roots near the rhizome, leaving only a length as to provide enough grip in the substrate. Please keep in mind that some rosettes e.g. Echinodorus and Sagittaria platyphylla have serious buoyancy. The leaves can be trimmed with plant scissors easily. This is necessary from time to time if you find old, dying leaves, leaves covered algae or if the plant has simply become too big. The trimmed stem will not produce a new leaf, but the rhizome’s tip in the middle of the rosette will. Like many perennial garden plants, rosette plants such as Cryptocoryne or Echinodorus can be divided and thus rejuvenated. A large, branching rhizome is separated into smaller plants (e. g. with a pair of scissors, in some cases, it can be pulled apart manually). It is important that the stem (the rhizome) of each plant remains intact and is not damaged too much. The rhizome can be recognized easily: it is the typical thickening on the leaf rosette base. Some plant species such as the popular Vallisneria propagate through stolons or runners. Starting from a stalk or a rosette, a side shoot (called stolon) is formed, which grows away from the plant above or below ground. New roots and leaves develop at the end of the lateral shoot, creating a completely new plant. Sagittaria, Helanthium and Vallisneria species in particular, spread through long runner "chains" with many young plants. Many ground-covering species such as Helanthium tenellum or Eleocharis multiply through creeping shoots. 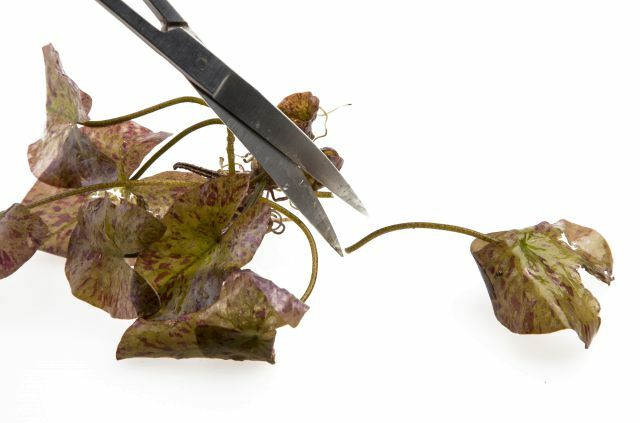 If you want to cut the leaves of a stoloniferous plant, maybe because they have grown too long or too old, just cut the leaves at any point with a pair of scissors. The remaining stumps die off over time. However, new leaves will develop in the middle of the leaf rosette and also on new branchings of the rootstock. Stoloniferous plant groups that have grown too dense should be thinned out, or new, individual plants can be produced: . 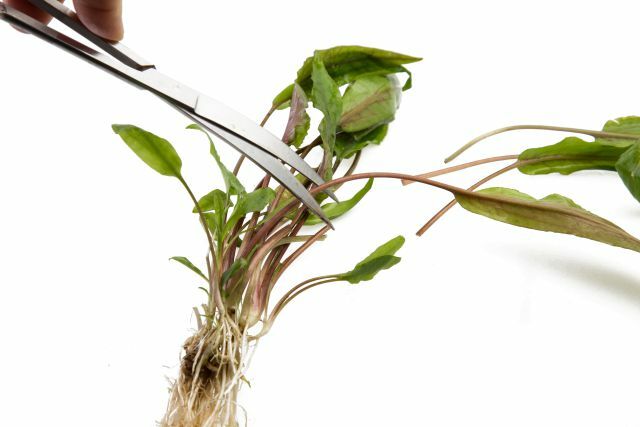 Either you pull a whole string of plantlets out of the soil and cut off the intermediate pieces of the stolons (runners) connecting the plants. The individual plants can then be planted back into the soil at the desired location. Or you cut the stolon inside the substrate and then pull out only those single plants that you want to remove and possibly plant them elsewhere, either using your hands or a pair of tweezers. Those who use soil have an advantage: The soil grains are so soft that they can be cut with scissors. 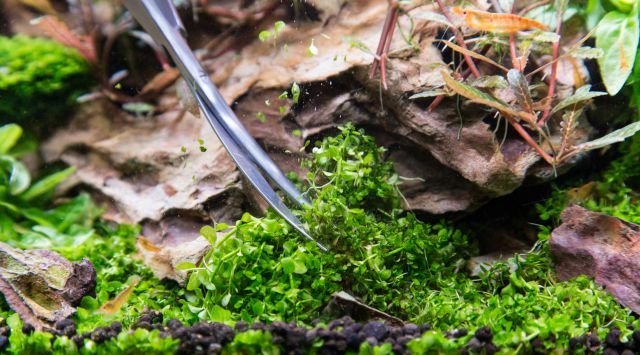 Therefore you can easily cut the runners growing underground by cutting into the soil with scissors, which is not possible when you use sand or gravel in your aquarium. Tuberous plants such as the popular tiger lotus or Aponogeton have plant stems in the form of round, thickened storage organs, which are often surrounded by a protective bark layer. From the shoot tips of these tubers, the plant sprouts its leaves and roots. Bulbous plants such as Crinum, on the other hand, have thickened leaf bases, which also serve as a storage organ. The bulbs and tubers of most aquarium plants should better be left alone and not be cut or divided. On the contrary, please take care so these storage organs remain intact. 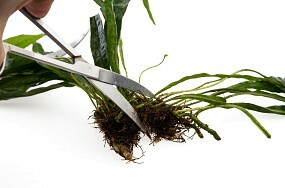 Roots or leaves that have gotten too big can be easily cut off with scissors. Any cut-off leaves will not re-grow from the petiole, new leaves will emerge from the shoot tip of the tuber.